I'm not sure Swan Knight's Son is a work of fiction. Mankind has always been beset by aliens. Before the technological revolution kicked into high gear, and little black-eyed, grey skinned men presented an unknowable and unseen threat from ‘beyond’, their role was filled by elfs. These unknowable and unseen threats from ‘beyond’ used their magic to hide in other worlds, just as the gray aliens use their advanced technology to hide among the stars. I had noticed that elfs and fairy creatures from the days before Tolkien and Gary Gygax, and indeed from before Shakespeare’s MIDSUMMER NIGHT’S DREAM, were actually quite spooky and frightening, not the pretty and twee tween girls of Disney’s Tinkerbell cartoons. I noticed traces of the sulfurous scent of the inferno clinging even to such recent and childish works as DARBY O’GILL AND THE LITTLE PEOPLE, a favorite film of mine, based on an older series of books, where the Leprechauns are terrified by the powers of a parish priest, whose blessings and exorcisms can shrivel them. Even in the lighthearted Disney version, as in the original books, the elfs are angelic beings who neither aided Satan during his rebellion, nor fought on the side of Heaven, and so were cast out of paradise, but not all the way to Hell. The more I read Appendix N authors, and their heirs like John C. Wright, the more I do have against noble elfs who in the end are just people, but with longer life-spans and a touch of magic about them. These days the Warcraft-ification of monsters has stripped them of their menace. Orcs are just people. Elves are just people. Dragons are just people. In the official D&D canon these days even demons are just people. They may look different, but they are just people. Sure, these creatures may suffer social backlash from bigots due to their savage nature, living in harmony with nature, magic blood and scaly skin, and their horns and hell-spawned parentage, respectively, but they are all just people like you and me. They want much the same things as you and me and Joe down the street. you but your death. Hellboy gets it. The easy observation here is that this humanizing of the inhuman is creatively speaking, very lazy. The elves that appear in so much of fantasy fiction today look little different than those presented in any Wizard's of the Coast tie-in novel. Wright's elfs, with their pageantry, chivalry, and complete antipathy to mankind would look very out of place on the streets of Waterdeep or the shores of Azeroth. ﻿﻿More pernicious by far, today's common conception of fantasy races loses the threat they pose to mankind. Instead, it is the inhuman's that have much to fear from mankind's insufficient love of diversity as the great evil. It's not outsiders that threaten men, but men who threaten outsiders. This modern desire to humanize the inhuman has cost our culture more than we realize. It clouds our judgement. It erases the magic and wonder and strangeness of our lives only to replace it with a comforting reassurance that there are no monsters – a dangerous thought in a universe that is overwhelmingly inimical to human life. John C. Wright's Swan Knight's Son is more than just an entertaining read. It is a reminder that evil exists in the world, that evil is often seductively beautiful, and that evil's first task is to convince us that it doesn't exist. In that last regard, the peddlers of elves as nature loving hippies, but people nonetheless, are much like the elves Gil faces - they seek to blind the world of man to the existence of evil for their own evil purposes. In the end, a fantasy tale that acknowledges the existence of evil is a more accurate rendering of human experience than a non-fiction tale that denies the existence of evil. 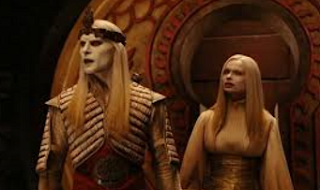 Hellboy 2 was one of my favorite recent pop-culture depictions of elves. Even though I knew 20 minutes in that it was going to have the same plot, twist, and ending as Fatal Fury: The Motion Picture, it was good enough that I didn't care.